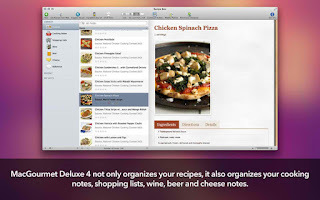 Introducing MacGourmet Deluxe 4, the most powerful food and drink management experience for the Mac! And El Capitan compatible. Updated the Food&Wine.com importer to support the new site format. Updated the NYTimes.com importer to support the new site format. Updated the Epicurious.com importer to support the new site format. Updated the FoodNetwork.com importer to support the new site format. Added (more) missing Retina display images and icons. Fixed a crash when using web clippings. Added new security for El Capitan.